Located in South England, the ruins of Corfe Castle overlook the tiny village of Corfe in the Purbecks. Protected from damage by the National Trust, it is popular with tourists. Located in South England, the ruins of Corfe Castle overlook the tiny village of Corfe in the Purbecks. It is now protected from damage by the National Trust, who own it. However this castle was not ruined by time, but the the effects of a determined artillery assault. A popular tourist destination and visible as a landmark from quite some distance, the Castle draws many visitors every year. Made of grey stone, the ruins of Corfe Castle overlook the small Purbeck village of Corfe. In its present form the Castle dates back to 1066 and is a major tourist attraction. The damage to the walls is not due to time or neglect, but to a major battle in the English Civil War, where medieval stone defences stood against a modern army armed with gunpowder and artillery. Now owned by the National Trust, the walk up to the Castle is steep as visitors have to climb the old defensive hill, with sides that are in places almost sheer. Steps have been added in some sections to make the climb easier, but the view from the top is incredible. Easily accessible from tourist locations like Bournemouth, Poole and Swanage, the castle draws many visitors each year. Few are aware of its darker past. The castle whose ruins we see today was built by the Normans after the Conquest in 1066. However, there have been forts on the site for much longer. As an unsettled area, the high hill, easy water supply, and strategic location meant that many different fortifications had been added to the site, even before the castle was built. The Purbecks, as a coastal area, saw battles between the Romans and the Celts, particularly the huge battle of Maiden Castle. Later in history, around 875, there was pillaging from the Danes and King Alfred built a castle on the site to act as garrison. It was in this earlier fort that an act of regicide took place. 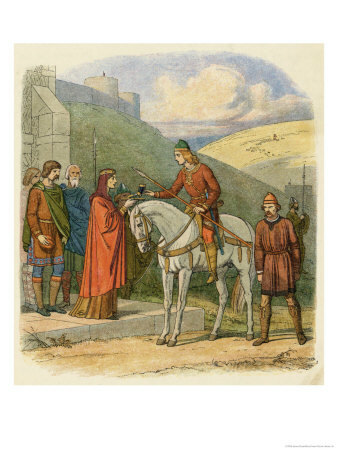 In 978 AD the young King Edward visited the site after a day's hunting. His stepmother and stepbrother lived nearby. He was greeted by servants who offered him a drink and, while he was distracted, stabbed him in the back and buried his body in an unmarked grave. He was only seventeen years old. The culprit is thought to have been his stepmother, Aethelthryth, who commited regicide so that her son, his half brother, would inherit the throne. Although he did, her son's reign was disastrous. Dubbed Ethelred "the Unready", his time on the throne saw the Danes plunder the kingdom. The stepmother retired to join an order of nuns. King Edward's body was recovered, and interred in a church in Wareham. Because of his good character, and youth at the time of his death he was granted the sobriquet "Edward the Martyr". 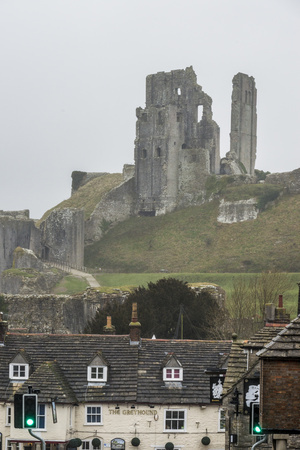 When the Normans arrived in 1066 they built the castle that we know as Corfe today. Built in a similar style to the still-intact Tower of London, Corfe Castle with its huge hill, thick stone walls and defensive ramparts must have seemed impregnable. The castle even had a well within the walls that would enable it to survive long sieges. 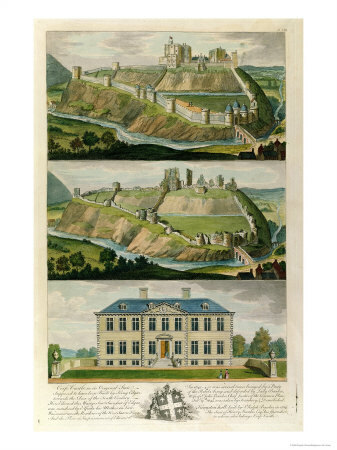 During the war between Stephen and Matilda, the castle was besieged by Stephen's forces, but as it would so many times in history, it remained unbreached and in the hands of Matilda's followers. Later in history, King John, notorious for being forced to sign the Magna Carta, also had links to Corfe. As well as briefly keeping his crown jewels here, he heavily reinforced it and used it as a prison. One of his uses was to hold a rebel's family hostage - if the rebel did not surrender, the family were left to starve. It remained in the hands of the Crown until Elizabeth I, who passed it to her Lord Chancellor. In 1635 it came into the hands of Sir John Banks, a supporter of, and Attorney General to Charles I. The outbreak of the Civil War tested medieval defenses against Cromwell's New Model Army. The Banks family were Royalists, and Corfe Castle ended up under siege twice. When John Bankes was ordered to York by the King, the defense of the castle fell to his wife, Lady Mary Bankes. The first siege failed after six weeks when the Parliamentarians withdrew. The second two years later in 1846 was more serious. The high hill and thick walls almost proved proof against the Roundheads, and at the end the castle finally fell to treachery when one of the lieutenants let the Roundheads through a gate. Lady Mary, by now known as "Brave Lady Mary" or "Brave Dame Mary", was allowed to keep the keys to the castle as a sign of her courage. However, the Parliamentarians gave the order that Corfe Castle itself should be levelled to prevent it becoming a threat again. Despite the tunnels, gunpowder and artillery they brought to bear, the medieval fort could not be completely destroyed although it was reduced to the ruins you see today. The single wall that stands on its own is often thought to look rather precarious. However even today, the castle is is much the same state as it was at the end of the Civil War. For an idea of how sturdy the ruins are, these two images were taken in 1906 and at the end of the twentieth century. The castle hasn't changed much. The castle is Corfe Castle. There is no "village of Corfe Castle"
The castle's official page - things to do, where to stay, and more. 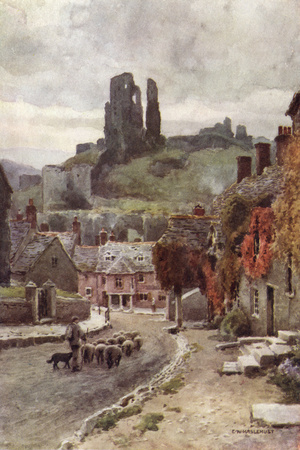 Tour book for Corfe Castle, Dorset, England. It includes history with black and white photos and drawings of the castle ruins and maps. Have you visited Corfe Castle or the Purbecks? Leave your views and reviews here! Thanks for the comment. It's a lovely place to go, and the countryside nearby is beautiful. 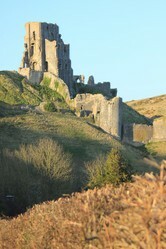 Thanks for the introduction to Corfe Castle - I'd love to visit it some day!